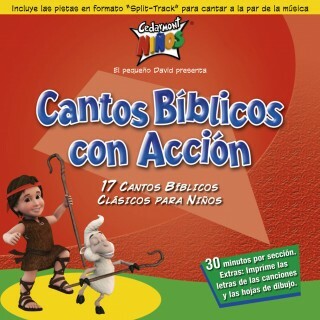 17 classic action-oriented Bible songs for kids, translated into Spanish and performed in a classic kids style by the Cedarmont Kids. Lyrics and split-track versions are included for singalong along with basic instructions for the actions. This enhanced CD includes printable activities and coloring pages in Spanish for your active child! NOTE: You may purchase actual CDs or the complete CD as downloads. Mp3 files are compressed at 256 Kbps for optimal sound quality and convenience. Downloads of the full CD include printable .pdf files of lyrics & any other printable files normally included with the regular CD. You may also buy single songs as mp3 downloads. These include only the mp3 file for that song, & can be added to your cart by clicking the red button for each song you wish to purchase. Live-action singalong video versions of all the songs on Cantos Biblicos con Acction (Spanish version of Action Bible Songs). NOTE: The download is compressed as mp4 (H.264) for optimal playback on computers and portable devices. The download contains only the Spanish version. Due to the large size of digital DVD files, the download process may take considerable time. Please be sure the download is complete before turning off your computer. Sign up now to receive regular updates! Design and Architecture by Anthology Creative © 2019 Cedarmont Kids All Rights Reserved.